Making good guesses probably does take talent to be among the first rank of those who make guesses. But being in the second rank is pretty good, too, and we can learn how to do that. Here are some tactics for guessing. Gregory (Scotland Yard detective): "Is there any other point to which you would wish to draw my attention?" Holmes: "To the curious incident of the dog in the night-time." Gregory: "The dog did nothing in the night-time." 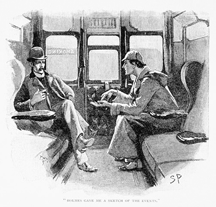 Holmes: "That was the curious incident." From this, Holmes deduces that the dog's master was the villain. This is an example of what I here call "Look for what's not there." Original book illustration, courtesy Wikimedia. In the first part of this series, we examined strategies for making good guesses — overall approaches that lead to excellent conjectures. Let's now turn to tactics for making good guesses based on what you see — and what you don't. Many guesses involve recognizing the absence of something important. Some missing factors are obvious, such as gaps in a sequence, or something missing that's usually implied by something that's present. See "On Noticing," Point Lookout for May 2, 2012, for more. Other missing items are more difficult to notice. For instance, consider two factors present in the situation before you. Then ask, if these two are connected in some way, what would that connecting feature imply? That implied attribute of the situation might be missing. If it is, what does that tell you? See "On Noticing," Point Lookout for May 2, 2012, for more. A temporal sequence is a sequence in which time of occurrence determines position in the sequence. Since time of occurrence is often confused with time of discovery or time of recognition, the first thing to sort out is temporal order. Once you know the order, you can reverse it, and consider whether the reversed sequence is actually possible. If the reversed sequence or any subset of it could have happened in that order, it's possible that the order you believe you have is actually incorrect. What if it is? What does that tell you? When most of us conjecture what others will do in a given situation, we tend to put too much weight on their character or motivation, and too little weight on how they experience that situation. This error is so common that it has a name: the Fundamental Attribution Error. of something importantcharacter or motivation is also an error, keep it in the mix. But think much more about how the situation looks to the people in question. What will they know? What will they not know? How will their past experiences influence what they notice or don't notice? What are others hiding? What disinformation is present? Focus on trying to see things from their vantage point, and then project the decisions they're likely to make based on the information they have. Most important, watch others. You probably know someone who makes consistently good guesses. Actually, you probably know more such people than you imagine you do. Many great guessers conceal from others — and sometimes themselves — that they're guessing. They present a demeanor of knowledge and confidence designed to conceal their guessing. Would you like to see your comments posted here? rbrenCGfVaWQcqgaRuZHUner@ChacdhqeyNIlJzaaOnYzoCanyon.comSend me your comments by email, or by Web form. Not only was the meeting running over, but it now seemed that the entire far end of the table was having its own meeting. Why are some meetings like this? When a group decides to take an action that nobody agrees with, but which no one is willing to question, we say that they're taking a trip to Abilene. Here are some tips for noticing and preventing trips to Abilene. Most of us interpret a confident manner as evidence of competence, and a hesitant manner as evidence of lesser ability. Recent research suggests that confidence and competence are inversely correlated. If so, our assessments of credibility and competence are thrown into question. Finding work in tough times goes a lot more easily if you have at least a minimum of equipment and space to do the job. Here are some thoughts about getting that infrastructure and managing it. Performance appraisal practices and project retrospectives both rely on evaluating performance after outcomes are known. Unfortunately, a well-known bias — hindsight bias — can limit the effectiveness of many organizational processes, including both performance appraisal and project retrospectives. See also Personal, Team, and Organizational Effectiveness and Project Management for more related articles. I offer email and telephone coaching at both corporate and individual rates. Contact Rick for details at rbrenEkfUogGIlszazTMAner@ChaclclDWbMmGDOkVABmoCanyon.com or (650) 787-6475, or toll-free in the continental US at (866) 378-5470.